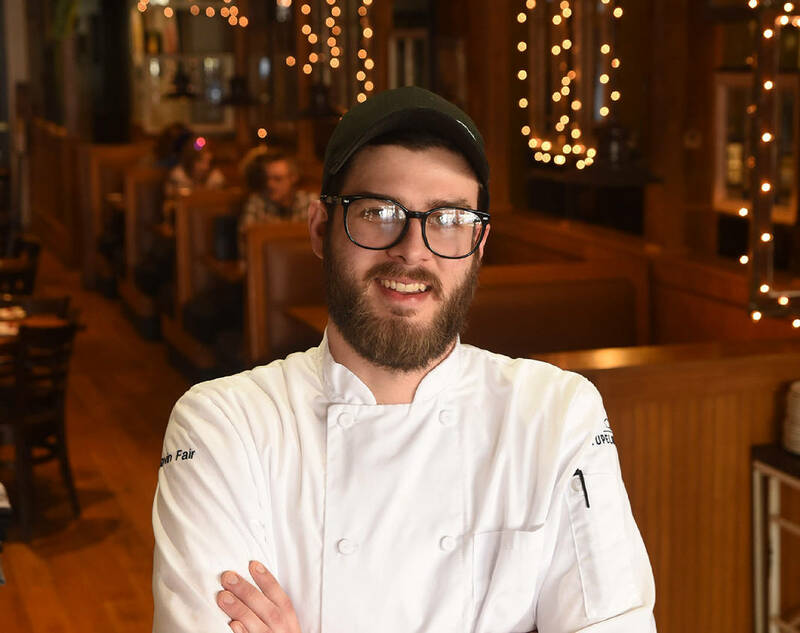 Gavin Fair is executive chef at Tupelo Honey inside Warehouse Row in downtown Chattanooga. Tupelo Honey, located at Warehouse Row, is a North Carolina-based chain that serves up a taste of the South with a hefty dose of Appalachian appeal thrown into the mix. So it's little wonder that on any given day, there's a crowd of folks hankering for a plate of Southern fare, such as a bowl of grits. But, says executive chef Gavin Fair, a native of Johnson City, Tennessee, from time to time, guests come through the doors never having had them. "They end up trying them at my suggestion, though," he says. "I get the ball rolling usually by asking if they've ever had polenta and giving them the comparison between the two if they have. It's always a great experience having people trying new things under our roof here at Tupelo." Here he talks about his favorite menu item at Tupelo Honey, how cooking became second nature and the musical instrument he plays. Q: So what do they think of grits once they've tried them? A: They usually love them — especially our interpretation with goat cheese grits. The goat cheese adds a delightful tartness that works really well with the creaminess of the grits. Q: Did you attend culinary school? A: No. All my culinary knowledge has been through years of application and I have fortunately had several mentors that taught me a great deal over the years, like Jay Shurtz — he's a professional chef who worked for decades in Michelin-starred restaurants in locations such as Vail, Colorado, and Las Vegas. He ended up moving to my hometown with his wife to be near her family. She's been a chef for the U.S. Olympic team on several occasions and is a formally trained pastry chef. They made for a culinary power couple. Chef Jay taught me so much in the time he was my executive chef at the Tupelo Honey Cafe in Johnson City. Even when I was just a saute cook, he saw potential in me and ended up being a huge influence on my skills and career. Q: How has your cooking style evolved through the years? A: I've had several opportunities to cook different styles of food in my life, starting with basic home-style Southern cooking from my family. I've prepared Italian food when I worked at Carrabba's. And I was employed at a Cuban restaurant for a few years. The majority of my cooking experience actually has come from the evolution of Tupelo Honey. The company started with a North Carolina native, Brian Sonoskus, as executive chef. Our current head chef, Eric Gabrynowicz, is from New York. It's been fun and interesting to see the evolution from chef Brian's foundation of creative interpretations on Southern comfort food to chef Eric's more modern Northern flair. He's introduced a lot of new flavors to Southern classics. Q: When did you realize you wanted to become a chef? A: I honestly was a cook for a while just to put myself through college and get my degree in exercise science. The more I worked in the industry, my passion and understanding only grew. I found a great deal of joy producing the highest quality of product to impress our patrons. I wouldn't say I was a natural, but the fundamentals became second nature to me. I absolutely love cooking, and being a head chef and leading a staff of talented cooks gave me the opportunity to contribute to something greater than myself. Q: What's your favorite thing on the menu? A: I would have to say the shrimp and grits. It's such a staple for us. The shrimp, the pepperonata (a mixture of stewed peppers, onions and tomatoes) and the Creole butter sauce all complement our grits so well. It's a very simple dish, but when executed right, it's truly a delight. Q: What cooking tool is essential to you? A: A good rubber spatula is always a really handy utensil to have. It's fantastic to use with eggs, but is also great for maximizing the yield of something out of the pan or the last bit of product in a container. Q: What's something surprising that people may not know about you? A: Though a little out of practice these days, I'm a jazz trumpet player. I've played brass instruments since I was 11 years old and was in the band all through high school. I still consider it a hobby of mine. Q: What's one of your favorite recipes? A: Bacon jam. It's sweet, it's savory, it's the whole package — a deliciously hearty condiment in my opinion. It's not on our menu anymore, but it made quite the impression on a steak-and-egg dish we once had. Dice bacon, and place in small sauce pot or pan on medium-high heat. Cook bacon, stirring constantly until bacon is crispy. Add diced onion and minced garlic, and cook for 5-6 more minutes. Drain the fat from the mixture, and add all the remaining ingredients. Reduce heat to very low, and continue to cook on low heat for an additional 5-6 hours, stirring more toward the last hour, until the bacon has softened and the mixture has thickened. Remove from heat, and place mixture in food processor. Puree until smooth, and allow to cool properly. Store, covered tightly, in coldest part of refrigerator. Note: Served hot or cold, this sweet/savory jam is a nice accompaniment for charcuterie arrangements of meats and cheeses. Or spread it on toast to pair with a good steak-and-egg breakfast.